The other day I posted an article Your Graphics Are Standing On Two GIMPy Legs. 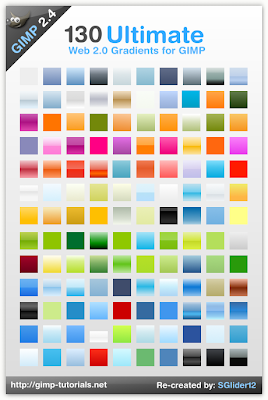 Today I wanted to tell you about a great set of gradients you can download for free. 130 Ultimate Web 2.0 Gradients for Gimp is SGlider12 has taken the time and effort to re-create the original 130 Ultimate Web 2.0 styles from Photoshop by deziner folio to "The Gimp". This is an awesome collection that has taken a lot of time to create. If you download these why don't you stop by SGlider12's blog and show him a bit of appreciation for his hard work. If you haven't yet been exposed to the wonderful world of "The Gimp" read my article Your Graphics Are Standing On Two GIMPy Legs, check out the sites I recommend, and of course download these gradients. Click on the image below for download information. Thanks to gimp-tutorials.net for the original post about this great collection. Get more profitable and productive information by subscribing to my FEED and my newsletter! or clicking the links below to bookmark my site, or add me to your favorites. You might want to check out my personal blog as well Cman's Cognitive Content. Your Welcome. I really enjoyed the first 20 and the full set has already come in very handy on the redesigns for some of my other blogs. I will be using them again shortly for this blogs new template. Once again thanks to you for your time and effort into making this great set of gradients.